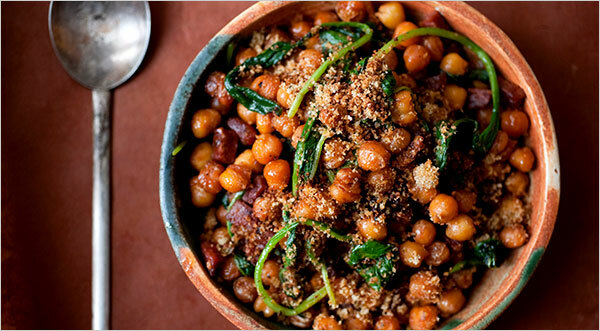 This recipe comes from the master of simplicity himself, Mark Bittman. It's a great crowd pleaser. I had a few cans of hominy left over from previous posole recipes and was trying to find a way to incorporate them into a non-soup dish. This is the perfect answer. Canned hominy is about the same shape/consistency as chickpeas and holds the flavor of the chorizo and sherry just as well. The bread crumbs are a bit much though, feel free to decrease the amount or neglect them altogether.